Tommy Heinrich, a photographer for the National Geographic Magazine and a mountaineer from Argentina, launched his book of photographs from mountains of Pakistan on Saturday at the Governor’s House. The book titled Pakistan’s Golden Thrones is a joint effort by the Argentinean Embassy, Bago Laboratories, Argentina and Ferozsons Laboratories Limited, Pakistan.Ferozsons CEO Osman Khalid Waleed also spoke on the occasion while Argentinean Ambassador to Pakistan Rodolfo Martin Saravia and Punjab Governor Latif Khosa also addressed the function.All of them endorsed the collaboration between the two countries for this cultural experience and to show the beauty of Pakistan’s natural landscapes. They concurred that this cultural exchange was an ‘excuse’ to strengthen bilateral relations. 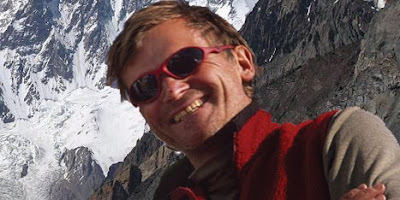 Heinrich, who is the first Argentinean to climb the Mount Everest, told Pakistan Today that this was his sixth visit to Pakistan and he was very impressed and awestruck by the beauty of the mountains, which fringed the northern borders. “I made my first visit in 1997 and since then I have been under the spell of Pakistani mountains. Other than Pakistan I have also climbed mountains in Nepal,” he said. “I began to then compile my pictures that I had taken there and to bring them in book form and though it was no easy task to select these pictures, I was supported by my countrymen. I am thankful to Pakistan for letting me see these places and to experience them and make them part of my life,” the photographer said. Summits of K2 are yet other places that he has been to. “K2 was a lot more difficult than Everest in that it was much steeper and more dangerous to climb,” he revealed. “At times it got really dangerous and I did feel nervous and scared; other times we braved on. Up there, there is a lot of air pressure, mist and it is extremely cold,” he said. Heinrich has managed to climb around 8,000 metres of K2, and says that he includes it in one of his biggest achievements. About Tommy Heinrich: Tommy Heinrich was born in Buenos Aires, Argentina. He began climbing at an early age in northern Patagonia and the high mountains of the Andes. After graduating with a degree in Animal Sciences, Tommy departed for the US, from where he traveled for over 15 years throughout the world combining his passion for photography and climbing the highest and remotest mountains. He has also been on an assignment for the National Geographic Magazine, where he photographed a Polish team doing a winter ascent of Nanga Parbat, located in Pakistan, which at 8.125 meters is the 9th highest mountain in the world. In 1995, he became the first person from Argentina to reach the summit of Mount Everest. Along with Brad Bull from the US, Apa Sherpa, Nima Rita, Arita and Lobsang Jangbu Sherpa, from Nepal they were the only six people to reach the summit of Everest through the South Col route during the entire 1995. Member of 10 Himalayan expeditions, he is the only person from Argentina to reach the summit of Lhotse, the fourth highest mountain in the world. In 1993, he did a solo ascent of Cholatse in Nepal, a 22,000 feet mountain in the Everest region. He has done several successful ascents of Aconcagua, the first one Solo in 1992. He has also done several first ascents of unnamed peaks in the Andes region. Through the years, he has done many alpine and rock climbing ascents in the US, Thailand and Argentina. Heinrich has done many big wall ascents in California's Yosemite Valley, El Capitan, Half Dome, Liberty Cap and many other challenging rock routes in the valley. He was hired to photograph and also film expeditions to Mt. Everest, Dhaulagiri and Aconcagua by CBS, Dish Network, and Canal 13 from Argentina. Heinrich’s film footage was shown on CBS, Discovery, CNN, Univision and most TV networks in Argentina. While working with photographer Doug Menuez, he assisted in commercial photo shoots for Versace, ABN Chicago Bank, Ford Motors Ltd, Levis Strauss, Verizon and others. He has documented both on film and photo, World Polo Championships in Argentina, England and France. He attended Rich Clarkson's photography workshops given by National Geographic and Sports Illustrated staff, specializing in nature, adventure and sports photography. His photographs have been published in catalogs and magazines in the US, Argentina and Europe.